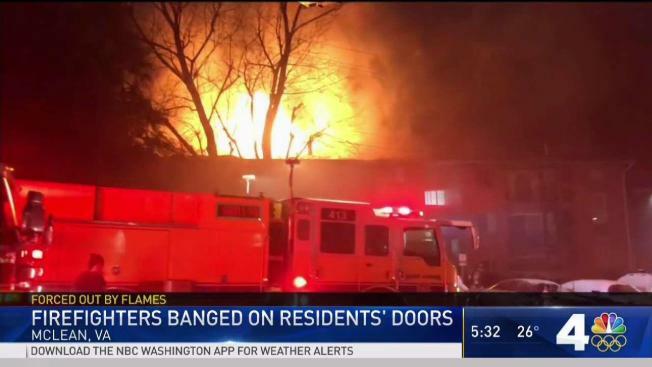 A blazing fire in a McLean, Virginia, apartment building displaced nearly three dozen people amid snowy, cold conditions Wednesday morning. Firefighters responded to a three-story garden apartment on the 1800 block of Wilson Lane, near Tysons Corner, after a fire was reported in the attic, officials said on Twitter. Firefighters evacuated some residents from bottom-floor apartments when they arrived. Some residents evacuated into temperatures in the 20s in bare feet or flip flops. "A lot of these families, when they left these apartments, they only had the clothes on their back," Fairfax Batallion Chief Willie Bailey said. The fire left 34 people temporarily without homes, officials say. "The apartment is probably a total loss," Bailey said. The Red Cross is helping the displaced people find new places to stay, and the Fairfax Fire department gave brand-new coats to the residents. Gifts were also given to some children displaced by the fire, Bailey said. Smoke was billowing from the top of the building before the flames engulfed part of the roof, fire officials said. Sixty firefighters from Arlington and Fairfax County rushed to extinguish the blaze. No one was injured, fire officials said. Officials are working to determine what caused the fire.